I saw a TV piece this morning about how what Michelle Obama is wearing has been stimulating the clothing sector of the economy. Designers tout how "everyday" and "every woman" Michelle's choice of clothes are. Inspired by Michelle's hips, one designer said that he is "specializing" in a line of clothing that is a little bit more "generous" in the hips. Folks. Puuuuleeeese! 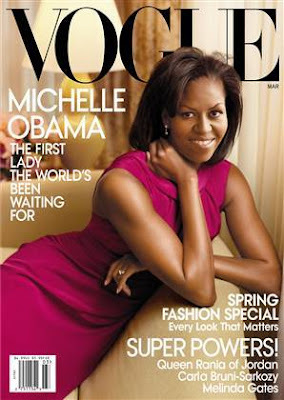 Does Michelle Obama have wide hips! OMG! Those are NOT wide hips, lol. If you want to see wide hips, come around to my neighborhood. Anyhow, go to the Prisoner's Wife's blog to read a beautiful poem by Lucille Clifton - "Homage to My Hips"
So sad that you have to look like Tori Spelling practically to be considered thin. I love her hips, and why is no one talking about how ginormous Laura and especially Barbara Bush's were? Love you. hey! thanks for stopping by my blog (and sending a link). to answer your question, no! she doesn't have WIDE hips. the media views anyting that isn't the "normal" American sterotype (read: white) as something exotic. they need to get over it & say they're making clothes for real women because that's what America looks like.